Black Friday/ Cyber Monday Table Saw Deals & Discounts updated! If you are searching for a good table saw deals during Black Friday/ Cyber Monday 2018, you have come to the right place. Here we present all current deals and discounts of table saws from all famous brands such as DEWALT, Ryobi, Bosch, Makita, Skil, Grizzly, Rockwell, Hitachi, Craftsman,…. for you to consider. Rockwell BladeRunner X2 Portable Tabletop Saw with Steel Rip Fence, Miter Gauge, and 7 Accessories – this model is one of the most popular table saw under $100 range. It is lightweight and capable of performing a variety of cutting tasks such as ripping, cross cutting, scroll cutting, and miter cutting. As this Rockwell table saw is very compact, you can bring on-the-go to your job-sites conveniently. There are 5 blades inside the package for you to cut from wood to ceramics or metal sheets. If your cutting sheets are not more than 1-1/2 inch thickness, this unit is a great choice for the money. Currently it is available with 30% off. 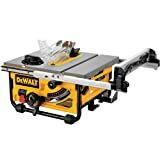 DEWALT DW745 10-Inch Compact Job-Site Table Saw– this model is the best deal from Dewalt with 24% off. It is an excellent table saw (10 inch table) for accurate performance. Although it is a 10 inch model, the exclusive fence system allows you to rip up to 20-inch capacity. With this table saw, you can cut thicker materials (3-1/8” at 90 degrees and 2-1/4” at 45 degrees with a single pass). It is just about 22 kg so you can also bring it to anywhere. If you are looking for a high quality table saw for accuracy, DEWALT DW745 is your great choice during this Black Friday. Although Hitachi C10RJ 10″ is available with greatest discount up to 38%, we do not recommend this model because it is not highly rated from consumers. You can also check for current deals, discounts of table saws from major brands below. Beside the discounts, there are top-rated table saw in 2018 on the top of the list for your recommendation. Some other brands like Makita, Grizzly, Skilsaw…are not in the list because they do not have discounts, deals on table saws so far. We will update when any new deal are tracked. You should also notice the deal and discounts percent are accurate at the published time and we will keep tracking regularly, however, they can be changed by the manufacturers anytime. Please check the price before buying. Benchtop table saw – for lightweight job saws. They are often under 65 lbs and easy to move around. Often, benchtop table saws are louder than a contractor saw and they are suitable for DIY, small workshops only. Depending on the brands and model series, the fence can be very accurate or very mediocre. There are quite many brands that offer deep discounts on benchtop table saw during the Black Friday event. For instance, Dewalt, Bosch, Skilsaw always have deep discounts off their successful models. You can check for these brands to find the best deal. Contractor saws are designed for heavy-duty performance. They often use induction motor (better performance, lower noise) and have larger tables. Often, they can be converted from 110 V to 230 V which is very convenient. Contractor saws are much heavier (up to 200 lbs) and the fence gauge is superb. Dewalt, Makita are best brands with contractor saws. While Dewalt often has discounts on Black Friday, Makita brand rarely has discounts. Cabinet saw are super heavy duty machine, which is designed for heavy use with few problems. It has a massive weight up to 450 lbs. Cabinet saw can cut more accurate and smoother. There are quite a few brands offer cabinet saws including Sawstop, Laguna, Powermatic, and Jet. Sawstop brand is the most common one. Guard supplied should be easy to set, to change and allow to have good views of the blade. DEWALT DW745 10’’ table saw perhaps the most popular choice for average DIY users who needs a compact table saw at a low cost. The whole unit is just 22 kg (45 lbs), allowing you to move from job sites to workshop easily. There is an onboard storage for you to keep the components and tools when not in use. Besides, you can connect the dust collection port to a shop vac for dust extraction. This unit is suitable for a DIY woodworker who needs a low price, portable table saw. DEWALT DW745 10’’ table saw uses a high voltage motor (15 amps) to give plenty of power for various woodworking tasks. You can cut from plywood to lumber with ease. The maximal cutting depth is 3-1/8 inches at 90 degrees and 2-1/4 inches at 45 degrees. DEWALT DW745 10’’ table saw has a miter fence but as it is a low price unit, the miter gauge of the unit is not very accurate. Many users attach a second miter fence to have a correct measurement. DEWALT DW745 10’’ table saw comes along with a blade (24 tooth SERIES 30 saw blade). Changing the blade is very simple and safe. At the moment, Dewalt DW745 is available with 24% discounts and we expect this is the best table saw deals from Dewalt during this shopping event. DEWALT DWE7491RS 10-Inch is a great job site saw for DIY woodworkers and homeowners. This unit is compact and portable so you can move around easily. Unlike the DEWALT DW745, This table saw DEWALT DWE7491RS is more accurate with a better miter gauge and larger cutting capacity up to 36’’ so that you can cut longer boards. A lot of users opt this model as it is by far one of the best 10’’ table saw which can serve as a semi cabinet model. There are plenty of applications you can do with this DEWALT DWE7491RS such as ripping filler boards (for cabinet installation), ripping hardwood boards, molding, cross-cutting, ripping lumber, sheet materials and so on. DEWALT DWE7491RS 10-Inch has an increased power and larger fence system to reach a cabinet table saw capacities. This unit has a no-load blade, a motor of 15 amps that can speed up to 4800 RPM, bigger dust port (2 1.2’’) and an impressive rip capacity up to 32 1/2’’ to cut larger shelving and trim materials. DEWALT DWE7491RS 10-Inch allows you to have better accuracy when making a narrow cut. The miter gauge of this unit is far better than the previous series (744, 745 and 7490 series). Good power, for hardwoods, make sure you got a sharp blade! Currently, this model is a little bit cheaper than daily price. We expect its price will remain the same during Black Friday 2018. SKILSAW SPT70WT-01 10″ table saw is a great table saw at a low price. This table saw is compact and lightweight enough for bringing around. It is very powerful, enough for you to cut through a 4 x 4 like a butter. It has a sturdy construction, no vibration when cutting and not very noisy. SKILSAW SPT70WT-01 10″ table saw use a 5 HP motor (15 amp) for increased cutting speed. The maximal ripping capacity is 25’’, maximal cutting depth is 3 1/2’’, which is quite sufficient for a variety of cutting tasks. This unit has a Self-aligning rip fence with on-tool storage for a true cut that goes from -1 to 46 degree. One thing you should notice that this model does not have the stand like others do. You may have to order separately.